Aaron McEneff pictured lifting the EA Sports Cup last season has signed for Shamrock Rovers. AARON McEneff has confirmed his departure from Derry City Football Club claiming 'it hasn't been an easy decision' to move on. The midfielder, who has spent three and a half seasons at his hometown club following a spell at Tottenham Hotspur, has joined Derry's League of Ireland rivals, Shamrock Rovers. 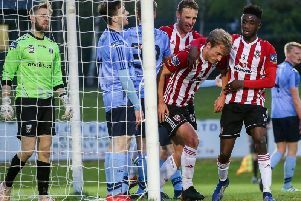 McEneff met with new Derry City boss, Declan Devine on Monday and was offered an improved contract but despite the option to remain with the Candy Stripes and with interest from double winners, Dundalk, the talented 23 year-old has joined Rovers claiming: 'At this moment in my career I feel it is time to move on'. The Cornshell native announced his decision this afternoon (Wednesday) on Twitter with the following message. "I'd like to thank everyone at Derry City Football Club who I have worked with and encountered over the three and half seasons I have been there. From my teammates, coaches, staff and the fans there has been ups and downs but I have special memories and difficult experiences that I'll take with me from my hometown club. "A club and a manager in Kenny Shiels who gave me the opportunity to play senior football regularly I will always appreciate it as I feel I have become a better player and person during that period. "This hasn't been an easy decision but I feel at this moment for my own career I have to move on. "So I'd like to wish Decky Devine, Kevin Deery, Marty McCann, Paddy McCourt and everyone at the club all the best for the future.